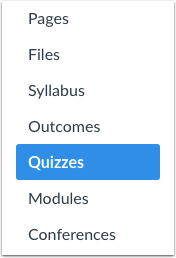 Once you have published a quiz, the quiz sidebar shows the Moderate Quiz link, which allows you to moderate the quiz for each student in your course. On the Moderate Quiz page you can view the progress of student submissions and view the number of quiz attempts each has taken. You can also grant students extra attempts, grant extra time for timed quizzes, and manually unlock quiz attempts. Depending on the size of your course, Moderate Quiz information may take a few minutes to update. You may have to refresh the page to view the most current data. If you change the quiz settings while a student is taking a quiz, the new settings will not apply until the student has completed the current attempt. To view the quiz attempts of a specific student, use the Search People field. To refresh the page and make sure all column statistics are current, click the refresh icon . If you view the Moderate Quiz page while a student is currently taking a quiz, the Time column shows the running time for the quiz. When time has expired, the Time column displays the submission as Time Up! For non-timed quizzes, the timer counts down to the quiz Until date. If no Until date is set for the quiz, the quiz defaults to the course end date. The highest number display is in months, days, hours, minutes, and seconds. Note: When students are taking a non-timed quiz, their timer will show the elapsed time counting up. If you view the Moderate Quiz page while a student is currently taking a timed quiz, the Time column shows the running time remaining in the quiz . When time has expired, the Time column displays the submission as Time Up! The quiz also displays a clock icon  that you can use to extend time on the current attempt. Learn more about moderating current timed quizzes. Note: When students are taking a timed quiz, their timer will show the elapsed time counting down. If the page displays a warning message, time has expired on one or more student submissions, but the submissions are outstanding and need to be manually submitted. Learn how to submit outstanding quizzes. You can use the Edit icon to moderate the quiz at any time for a student. Moderating a quiz lets you give students extra attempts and manually unlock quiz attempts. Depending on the quiz settings, you can also give extra time for timed quizzes and let students see quiz results one more time. If you want moderate a quiz for multiple students and apply the same settings for each, you can apply your changes to all students at once. Learn more about giving extra quiz attempts. Previous Topic:Once I publish a quiz, how do I make additional changes? Next Topic:Once I publish a quiz, what kinds of quiz statistics are available? Table of Contents > Quizzes > Once I publish a quiz, how do I use the Moderate Quiz page? Re: Can I reset the quiz timer for a student?